For full views, click on images. Love those classic diamond shapes called Argyle, but are mystified about how to accomplish them? 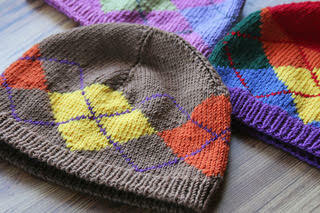 This workshop covers the classic technique of knitting Argyle flat, by knitting a hat designed by me! Covered will be tips and tricks for managing the bobbins and twisting the yarns appropriately, and a seaming method that makes the seam nearly invisible and not bulky. Also covered is how to calculate designs of your own Argyle diamonds for different gauges, so you can include Argyle pretty much where ever you want! Love those classic diamond shapes called Argyle, but are mystified about how to accomplish them? In this workshop, learn the classic technique of knitting Argyle flat, including tips and tricks for managing the bobbins and twisting the yarns appropriately and a seaming method that makes the seam nearly invisible and not bulky. Each stage of the construction of an argyle sock will be covered, which is both similar and different to the traditional top down heel flap sock. Also covered will be how to chart your own Argyle patterns for different gauges, very cool retro and contemporary variations on Argyle, other intarsia retro sock designs, and designing with Argyle patterns in garments and accessories. You will learn on a pattern for DK wt yarn so the sock will work up rather quickly in learning the technique. Many different design choices go into making fingerless mitts and gloves, but once you master the conceptual framework of those design choices, you can create a wide array of looks to keep your hands warm! I have prepared some (pretty amazing!) templates and schematics that have the stitch counts and math all worked out for four different gusset choices for 7 hand sizes with five stitch gauges. Step by step design choices at each transition point—cuff, hand, gusset, edgings—will be covered, including how to make the design process easy at these transition points, while still accomplishing a design that has a sense of flow and purpose in its overall statement of fashion. Also covered is how to plan ease of design for multiple sizes, or knowing when not to do multiple sizes. Participants will work on a design in class, plan its over all construction, and bring it to life on the needles. This multi-day class gives plenty of “hands on” time of browsing reference books for ideas, sketching designs, swatching stitch patterns, group review and feedback as one progresses, and one-on-one problem solving with the instructor. Given the longer time in class, participants learn the ins and outs of designing with hands-on trial, including testing out possibilities, finding what works and when to “think again”. Using the templates with one’s chosen gauge, size, stitch pattern, and edging, etc., participants create their own unique fingerless mitt! With Mosaic Knitting, you knit with only one color per row to achieve intricate looking patterns without stranding or intarsia wrapping. 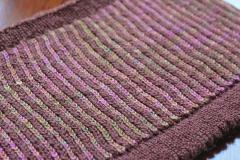 You simply knit and slip stitches, but the result is stunning! This workshop will teach you how to do several textural variations of Mosaic Knitting, how color and hues work together (or don’t), how charts are written and read differently for Mosaic Knitting, and practical tips about the best applications for Mosaic Knitting in garments and accessories. Once you learn the technique, and practice it in a swatch, you will begin a hat pattern designed by the instructor that you can quickly complete at home. 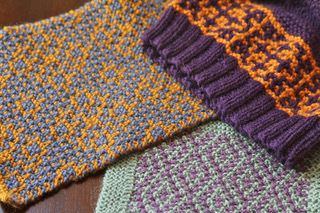 An added bonus: several other colorwork slip stitch variations of garter st will be overviewed with color samples. You’ll be amazed what well-placed slip sts and color changes do to garter st! Vertical stripes Without Stranding and a Cushiony Fabric! Knitting in the Stitch below is a stitch technique best known for creating stunning vertical stripes. But it can also be used to create textual interest, checkered patterns, and embossed ribs. In this workshop, we will cover all of those variations and their characteristics, with participants learning the techniques and practicing them. Also covered is appropriate cast-ons and bind-offs to accommodate the cushiony, wider stitches of the fabric. In the six hour workshop, participants begin a two-color vertical stripe scarf or a two-color vertical stripe cowl (his/her choice). Step by step worksheets for planning and beginning these projects. Ever look at your knitting and say, “What happened THERE?”, or panicked as a dropped stitch ran down it, or picked up your knitting project and wondered “Where am I in the pattern?”—how many decreases/increases have I worked, what row was I on, how many rows since that last decrease, or last cable twist, etc.? This workshop answers these questions and a lot more! Divided into two sections, “Knowing Where You Are” and “Identifying and Correcting Mistakes”, this workshop teaches participants how to “read” your knitting--to recognize what one is looking at, where one is, and what to do next, whether that be correcting a problem or moving ahead! People leave this workshop as much more competent knitters. Cables and Twists make some of the most stunning visual effects in knitting. Learn the basic cable and twist stitches, which will allow you to create visual effects of twisting, turning, honeycomb, braiding, and the like. Using over 25 swatch examples in class, this workshop covers different cabling effects, both crosses and twists (to create “running” lines), how to achieve them and combine them, along with practicing several cable and twist stitches in class. How to correct a rope cable lower down in knitted fabric that is twisted in the wrong direction will also be demonstrated. We knitters all have our “go to” cast-on, the one which is automatic in our head and hands, and flows quickly. However, as our experience grows, we begin to recognize that different projects require different types of cast-ons. Some projects need stretchy cast-ons, others need a cast-on that allows knitting in two directions, and some projects gain sophistication and pizzazz by having a decorative edge cast-on. This class covers thirteen cast-ons, including German Twisted, Crochet, Provisional, Channel Island, Tubular, I-cord, Braided Two Color, Frilled, Picot, Rolled Edge, Sophisticated Two Needle (with a twist), and Judy’s Magic Cast-on, . Come discover a new versatility in beginning projects! How one finishes the edge of a project can either make or break it. Ever bind off a cowl only to find the edge way tighter than the cast on? Or wish there was a bind off that would match your cast on? How about decorating that edge with a rolled tube look, or adding picots to it? 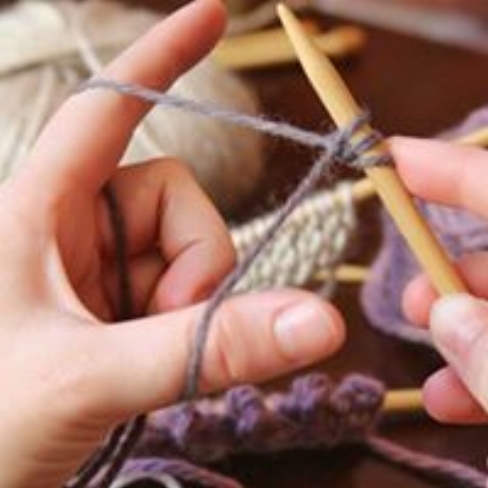 This workshop will cover a wide range of bind offs that achieve a variety of bind off goals. Bind offs covered are: Russian, Yarn Over, Jeny’s Surprisingly Stretchy, Tubular, I-cord, Sewn, Picot, Cable, Braided Rib, Icelandic, 3-needle, and Sewn (and others as time allows!). Side seam of very fitted men’s vest, right side and wrong side. Click image for full view. Many people simply guess at how to seam together their sweater or graft together a cowl or other accessory. And it shows! (Unfortunately!) 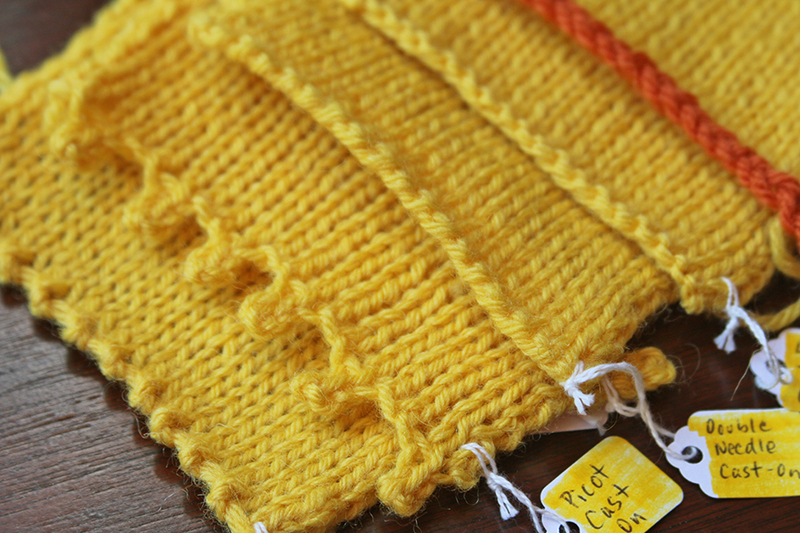 Learn the best ways to seam and graft, including vertical sides of garments, ribbing, bound off edges, vertical edges to horizontal edges, and vertical sides of garter stitch. Also covered will be Kitchener stitch, 3 needle bind off, and 3 needle bind off with I-Cord edging. Aviatrix Hat by Justine Turner is a favorite hat knit flat with short rows. It has multiple sizes for multiple gauges. Click here. Shape a collar or a shoulder slope, make a toe or heel, work an inset sleeve cap within an armhole (an easy way to work an inset sleeve downward), shape a shawl, or knit a hat on straight needles, achieving a rounded shape by building the entire circumference with short rows and no seaming. This is a versatile technique! 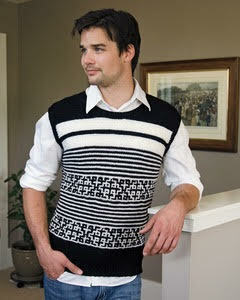 You will learn two ways of doing short rows and knit some practice swatches. Then we will explore several applications of short rows—sock heels, shoulder shaping, and inset sleeve cap with short rows.